'It begins with absence and desire, it begins with blood and fear, it begins with a discovery of witches.' It's also the words that begin every episode of Sky One's new supernatural drama, based on the All Souls trilogy of novels by Deborah Harkness, which finds monsters and magic existing undetected in modern Britain. 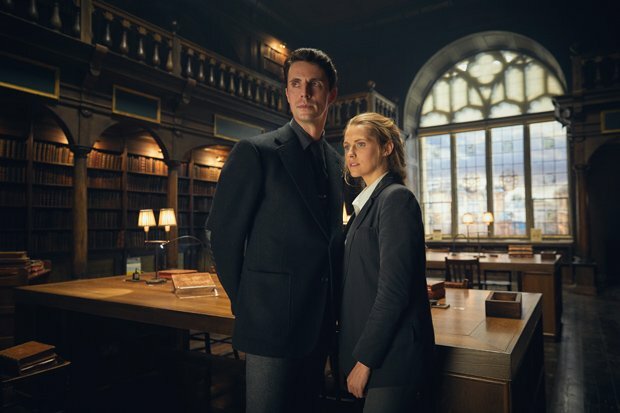 Diana Bishop (Teresa Palmer) is an American academic, and lapsed witch, who inadvertently opens an ancient manuscript buried deep in the bowels of the Bodleian Library while carrying out research at Oxford University. The discovery of this antique text draws witches, vampires and demons as an age-old prophecy proclaims it contains dark power that might be linked to a disturbance in the world's magical forces. Harkness' books have been praised for their historical accuracy and page turning pace. However this TV adaptation forgets to add any sense of dynamism or character. There's a lot of talk of magic and prophecies but very little action. Everyone just stands around looking consternated while delivering their lines in breathy hushed tones. The grey colour palette only adds to the gloom. The actors are all fine (the cast also includes Alex Kingston, Lindsay Duncan, Owen Teale and Greg McHugh) but merge into a stodgy mass of vaguely supernatural stock characters. Only Matthew Goode stands out, bringing both charisma and danger to suave sophisticated vampire Matthew Clairmont, struggling to keep his blood thirsty urges in check. By episode three it dawns on you that the paranormal trappings are just window-dressing for a tale of forbidden love and smouldering passion. A storyline we've seen rehashed again and again in Twilight, The Vampire Diaries, True Blood, Buffy, etc, etc. A missed opportunity to add something new to a well-worn cliché. Episodes watched: One—four of eight. A Discovery of Witches is on Sky One from Fri 14 Sep, 9pm. It's a bit light to note a series on half of the episodes ... and for 2/5 ... And in fact, the story is so complex that maybe it takes time to install the basics. I actually liked it. You say cliche but think you confuse cliche with key elements of the urban fantasy genre. Cliche is fangs, burns in sun light, witches in robes chanting. If you read urban fantasy, paranormal fantasy, paranormal romance, you find basic key elements. Often a heroine either already badass or who will become badass who will team up with the unlikely male character to solve whatever the plot is. They will start off as semi enemies and finish off falling in love sometimes fast sometimes over many books. Granted not always enemies at start can just be met during an investigation but still. Either he or she or both often have trauma in their past. Together they will have to fight many foes even of their own kin sometimes. There will be epic fights. So you may call this cliche but it's just the genre. So I think a 2 is really harsh. I think this follows the rules very well and I've been waiting for a show like this for a long time. Plus you can't compare tv show and films. If you don't like the genre then you won't like the show. The show is dreadful and dull, other than the lovely scenery in which it is shot. The plot is too complex and the acting is painful and story is dragging it's heals. Love the books and the series. It's not dreadful or dull. The characters are developing as the series progresses, which is how most series go. You just have to give it a chance and not come with some pre-conceived ideas of what the genre should be. If you have ideas like that then write your own series of books and see if they get published and then turned into a T.V. series. Most, I can guarantee, won't even reach the selves let alone a T.V. series. I like the characters and hope the show continues. I also have to agree with Rorosi G, wholeheartedly, about the cliche remark. It's not cliche just a twist on the genre, no fangs, turning into bats, burning in sun, or glittering diamond skin that enables a daywalker, those are cliche. I would love to see a series created from Elizabeth Hunter's Elemental Mysteries, now that does put a serious twist on vampires and the powers that they possess. Love the characters as well. The books were splendid. The series? Not so much. After the 3rd episode, I had to forget everything I'd read in the books and see the series as a completely different entity. There were too many issues with the casting of characters, such as differing accents, for example: Isabeau and Marthe don't have French accents as they did in the books, which I feel is imperative for their characters going forward. Marcus is a dark-haired, stoic vampire, when he was depicted as fun-loving and BLOND in the books. Also, I realize that in consideration of time allotted for each episode, certain aspects from the books have been either skirted over or left out completely, but there is too much missing to tie all of the characters and scenarios together. For those who haven't read the books, I fear that there isn't enough detail, which the books provided beautifully to keep the interest of the newbies. For those of us who have read the books, so much has been left out or rewritten that the story is nearly unrecognizable. Very disappointing. I'll watch the remaining episodes for this initial season, but I'm not sure I'll continue watching it for another season - if it is renewed for another season, that is. A Discovery of Witches. Having read the books l was so excited to see they had done a series. However how disappointing. The producer and casting agent obviously has not read the books, if they had they would have done a better job. Matthew is supposed to have the body of a warrior and a face of an angel. The actor that plays Matthew is tall, so that checks but although handsome, does not have the stance or body of a warrior. When his blood lust is upon him, he looks as if he is constipated not in the throes of a blood lust. Ysabeau is according to the books young and stunning. The actress who plays her looks well into her 60’s. Baldwin is according to the books powerfully built, again like a warrior, tall and a red head. In the series he looks like a middle aged bank clerk. Marcus is tall and fair haired and American. In the series he is short and dark haired and sounds completely British. So many bits have been removed and others added, that what could have been a great series is lacklustre and mediocre, with some incredibly wooden acting. Each time Diana has flown she looks as if she is in a nativity play and being hoisted up. What’s with the feet and weird leg positioning? Too much has been taken out and too much put in, that’s not in the books, overall it’s disappointing.